dhtmlxColorPicker component is a smart color picker that can be easily used either as an inline control or as a popup dialog box. Its intuitive interface, flexibility and simplicity of usage make this component a good aid for different projects and applications. Covers the processes of skinning and localizing Colorpicker. 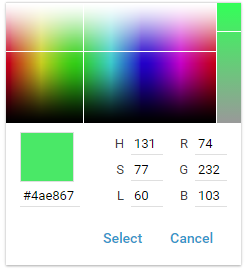 Describes possible operations with ColorPicker and colors and shows the basics of ColorPicker event handling.